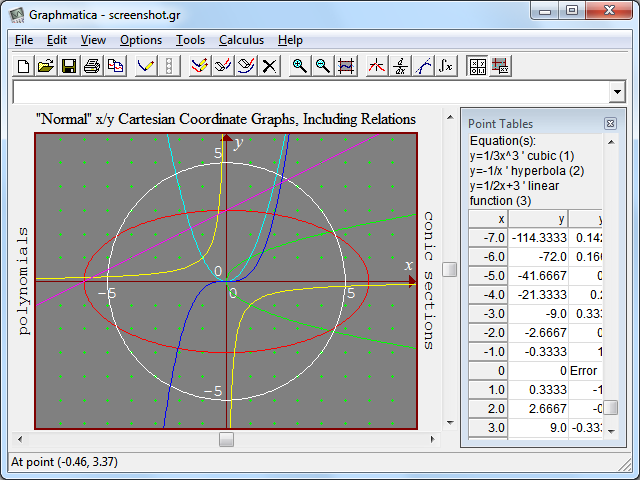 Graphmatica version 2.4 for Windows runs on all modern 32- and 64-bit Windows platforms: Windows XP/Vista/7/8.x/10. For a list of changes since version 2.3, please see the 2.4 upgrade page. Powerful graphing engine. You can choose between six styles of graphing: regular Cartesian, polar, parametric, and slope-field and initial-value approximations for up to fourth-order ODEs (and fourth-order linear systems as well), all detected automatically based on which variables you use in your equation. Cartesian inequalities are supported as well. Most graphs appear instantly on modern machines. Lots of output options. Graphmatica lets you copy equations, point tables, and graphs to the clipboard, export graphs as JPEG or PNG files to share on the web, and print graphs and point tables in high-quality color or black and white.